62. For transmitting two speeds, one of which is a different and variable motion. 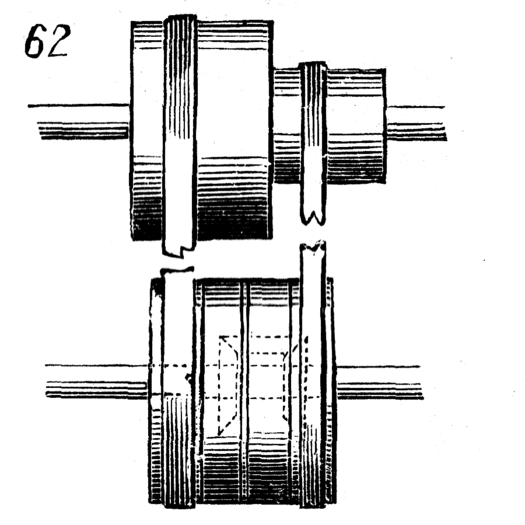 This is very similar to the last, except in the third bevel-gear being attached to a fourth pulley, at the right of the other three, and driven by a band from a small pulley on shaft above. When left-hand belt is on the pulley carrying the middle bevel-gear, and pulley at the right turns in the same direction, the amount of rotation of the third bevel-gear must be deducted from the double speed which the shaft would have if this gear was at rest. If, on the contrary, the right-hand belt be crossed so as to turn the pulley in an opposite direction, that amount must be added.